Domestic grain prices more than doubled in 2012. The government may resort to imports to stabilize the situation. Russia’s grain export contracts could be up for review, since a series of bad harvests and rising prices have resulted in shrinking domestic grain stockpiles. The government is considering a series of steps in a bid to stabilize the market — from giving financial aid to grain producers to purchasing grain abroad for an intervention fund. What role does Russia play on the global food scene? According to Russia’s Ministry of Agriculture, the country ranked third globally in terms of grain exports in 2012. Last year, Russia sold over 26 million tons to buyers in more than 80 countries, with Egypt, Turkey and Saudi Arabia traditionally being the key importers of Russian grain. 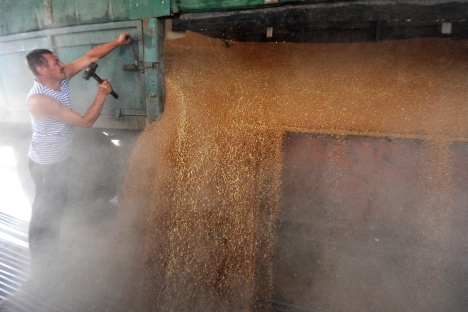 The country’s grain stockpiles stood at 25.3 million tons at the beginning of 2013. Last year, Russia started out with even bigger inventories, at 36 million tons. However, droughts and failed crops of recent years have been the key reason behind the fall in production, forcing the government to impose an export ban in 2010 (Fig. 1). As a result of dwindling supplies, prices have skyrocketed to an all-time high of $390 per ton. Prices have been growing by 1–1.5 percent a week; a ton of grain costs almost $100 more in the domestic market than it does internationally. According to the USDA, Russia was the fifth largest grain exporter in the 2012/2013 agricultural year, after the United States, Australia, Canada and the European Union. According to the USDA’s January report, India ranked sixth, followed by Argentina, Kazakhstan and Ukraine. “Grain prices doubled in European Russia last year, and rose by between 127 percent and 145 percent in the Asian part of the country,” Russia’s deputy minister of agriculture, Ilya Shestakov, said recently. Shestakov added that he believes prices will continue to rise in 2013. An adverse situation in the commodity market also pushed flour and bread prices up quite rapidly last year. Statistics show that the average price for flour had risen 1.5 times (54 percent) by the end of December 2012, while retail prices for bread had increased by 12 percent, due to the lower share of grain in its cost of production (Fig. 2 here). Russian millers produced just 8.8 million tons of flour in 2012 — the lowest amount since 1991. Concerned about the problems affecting the agro-industrial complex — one of the country’s key economic sectors — the government has been trying to take urgent measures to stabilize grain prices and the market situation as a whole. The government established an intervention fund in 2001, to purchase grain and support prices. For example, when prices were low, the government bought grain into the fund to bolster prices; when prices rose, the grain was sold from the fund. During more than 10 years in existence, the fund has only been replenished through purchases from domestic companies. However, the grain crop declined again this year (to slightly more than 70 million tons, according to official data) because of last summer’s drought, forcing the government to replenish the grain fund once again. Except that, this time around, Russia could buy grain abroad for the first time. This is a last-resort step and not yet an approved decision. “Most likely, there will be no need to import grain to fill the intervention fund. Preliminary stockpile estimates are running rather high at around 80–90 million tons,” Finam Management analyst Maksim Klyagin said. In the worst-case scenario, according to the expert, strategic stockpiles could be built by purchasing inexpensive grain from neighboring Kazakhstan, which has been running substantial surpluses in recent years.